The Scream refers to different versions of a painting made by Edvard Munch. They were painted in the early 20th century, and drawn using many types of materials. These include lithography, tempera paint, oil paint and pastel. 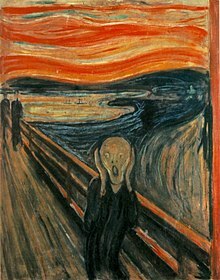 The first version of The Scream was drawn in 1893. Two pastel drawings, two paintings and also some lithographs were printed. This page was last changed on 4 May 2017, at 16:49.